Sharon Sands love of boxing began when she was just a little girl. She would sit in awe in front of the television watching boxing matches with her father. This little girl’s love of boxing would lead to an even greater love for the sport as she grew up. She would eventually travel across the nation attending as many boxing matches in person as she could. When she couldn’t be there in person, she would make sure to watch the match on the television. You could even say boxing was her first love. This love of boxing would one day lead her inside the ring – calling the shots. One of six kids, Sharon grew up in a very athletic home – every morning before breakfast, their father would play a song called Chicken Fat and they all knew it was time to exercise and sing along. Her father learned all about exercise and structure in the military and it came in handy when managing six young children. Sharon continued her athleticism playing basketball, running track, serving as a lifeguard, and even set a national record as a hurdler when she was in high school. As an adult, she would grow up to be an attorney and own a boxing gym. But the love of boxing and being in the ring was always on her mind. When she was initially approached to become an amateur referee back in the 1990’s, she declined. After much thought, she decided to go for it and seize the opportunity. 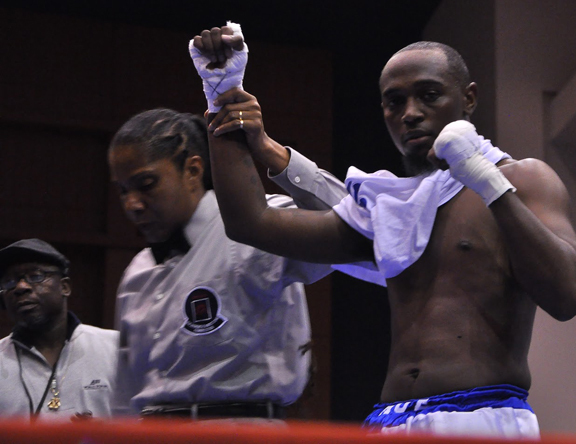 Being a new referee in the boxing world can be intimidating and challenging. Just like the hurdles she jumped over setting a national record in high school, she would do the same exact thing as a referee in amateur and professional boxing. Sharon would spend 14 years an amateur boxing referee on the West Coast and the East Coast before officially becoming a California professional boxing referee last month. For the last 20 years in California, it has been male referees calling the shots inside the professional boxing ring. Sands is the first female referee in California in more than two decades to officiate a professional boxing match. A recent bout in Southern California was the first evaluation of Ms. Sands as she earns a permanent professional license. So, during a boxing match, she is the one responsible for enforcing the rules inside the ring. The last woman to do this in California was Gwen Adair back in the 1990’s. If you think becoming a professional boxing referee is easy, think again. They are licensed and regulated by the California State Athletic Commission and must meet some of the strictest requirements and guidelines in the nation.